As Christian already stated, we are currently in this lovely city with friendly people whom we French people have great trouble understanding, totally insane traffic and colourful taxis you find nowhere else, and dangerously spicy food. And no, it’s not Mexico City. My first talk at FOSS.IN/2007 in Bangalore, India (Giving back to the community: how does Debian perform?) was an attempt at explaining to upstream developers what Debian did with their software, and where to proactively find information about the changes we do, the bugs that are reported, etc. I did this talk because Bangalore has this incredible ratio of software developers per square kilometer, while at the same time we have so few Indian DDs despite the 1.12 billion inhabitants. So I expected to find people doing much development but not necessarily familiar with Debian. With Christian’s two other talks about translation works in Debian and how to contribute to Debian, we did quite a thorough coverage of Debian for a novice audience. 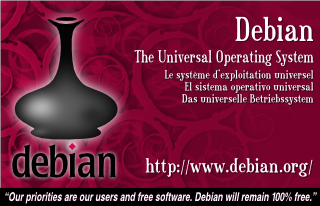 My second talk, in the main conference track, will be on Saturday and will be an even more general presentation of Debian. Of course, my slides are not ready yet, what did you expect? 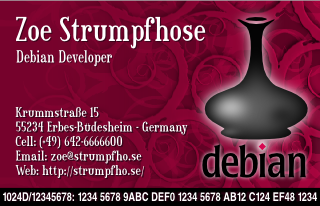 There has been great interest in my Debian business cards, so I’m providing their SVG source (to be loaded and printed in Inkscape, for they make extensive use of the blur effect which is an Inkscape extension) for anyone interested. They use the Sexsmith and Sans Condensed Uralic fonts, available in Debian packages ttf-larabie-straight and ttf-uralic. I don’t know enough about SVG scripting and object cloning, so to do the text shadow you will have to edit the same object twice. Sorry about that. 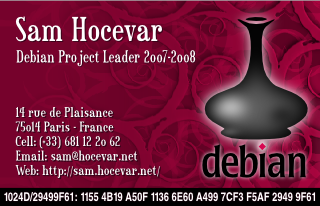 Here are the files: background image (PNG), generic DD front (SVG), custom DPL front (SVG), back (SVG). 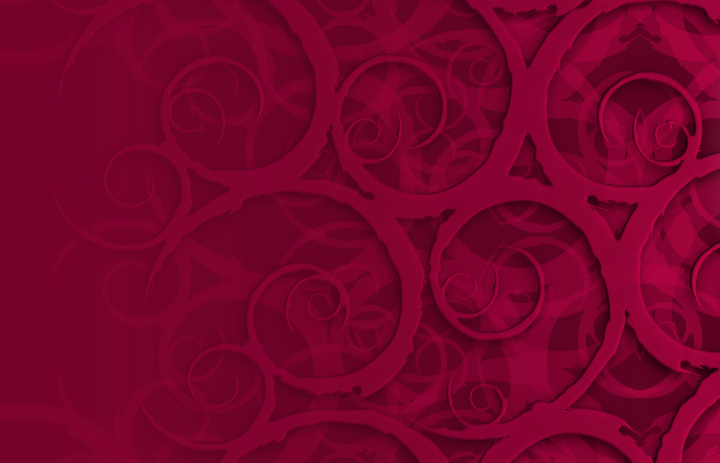 The background image was cropped from Ayo’s Debian Expo wallpaper. The rest of the design should be considered public domain. Just a note about the different languages I’ve been using at the back: I know I could have used more fancy languages with beautiful glyphs to show how truly universal our system is, but I did not know which to choose. So I just put the languages I personally vaguely understood. Show the last 10 | 20 | 50 entries.